Highland Pulp has a long history of taking the business of contract harvesting very seriously. 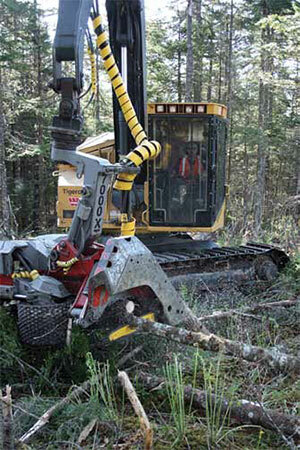 Their strong focus on business gained them the distinction of being selected the Canadian Woodlands Forum’s Logging Contractor of the Year for 2012. The Truro, Nova Scotia-based business has been a major mechanical harvester since the 1960s. While the current owners, James, Robert and Kevin Tompkins, each take an active part in the business management and day-to-day operations, they owe part of their success to the creativity and diligence of their late father, Donald Tompkins, who was a pioneer in mechanized harvesting in Nova Scotia. Donald began mechanized harvesting with Beloit harvesters and later advanced to Koehrings in the Cape Breton Highlands. As time passed, Highland Pulp adopted new technologies and built an enviable reputation for quality operations and high productivity. As the spruce budworm virtually extinguished harvesting in the Cape Breton Highlands, the Tompkins packed up their operation and moved to new headquarters on the mainland at East Mountain near Truro in 1989. In the new location, Highland Pulp continued to supply pulp wood to Stora, owners of the Port Hawkesbury (Cape Breton) pulp mill, and sawlogs to mainland sawmills. 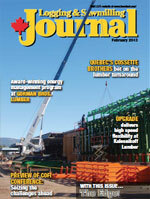 In 2011, New Page, the most recent owners of the Port Hawkesbury mill, shut down the pulp operation. As a result, Highland Pulp went to work for the Bowater mill in western Nova Scotia, and then in early 2012, Bowater shut down their operations. To say it has been a challenging past 18 months for the company would be an understatement. Still James Tompkins, General Manager of Highland Pulp, says he remains optimistic about the new owners of the Port Hawkesbury mill—Pacific West Commercial Corporation—and its start-up. Kevin Tompkins (left in photo) is a harvester operator on the logging operations of Highland Pulp, while brother James Tompkins (right) has the job of business manager. But all three brothers—Kevin, James and Rob—can readily fill in to operate machines, or assist on repairs, as required. In addition to doing some conventional log harvesting through the summer of 2012, Highland had been harvesting stem biomass for the thermal power plant adjacent to the Port Hawkesbury mill. While three brothers working in the same company could be a recipe for personality conflicts, Highland Pulp has developed an operations strategy that is very successful. Each brother has their specific responsibilities in the day-to-day operations, and they join together to work out major decisions around issues like equipment purchases and other critical business decisions. James fills the business manager boots, but explains that he is also available to fill in as machine operator, float driver, mechanic and welder. Someone has to focus on and be able to make those critical day-to-day business decisions, he says. “You view things differently if you are on site pulling wrenches or operating a machine. Your focus is on the piece of equipment you’re fixing or the stand you are working in—you do not have perspective of the entire operation. While the three brothers each have the moniker ‘mechanic’ in their resume, each adds several other skills. James holds an industrial mechanic certificate, and will handle major machine repairs and overhauls (like transmission rebuilds) that are done in the headquarters shop. Robert acts as lead mechanic on operations, and is also the on-site operations manager. Third brother Kevin also possesses significant mechanical talents and is a harvester operator on the daily operations. All three brothers can readily fill in to operate machines, or assist on repairs, as required. A part of the Highlands Pulp business plan is the third generation Tompkins; James’ sons, Michael and Adam, are working in the family business and being groomed to assume management responsibilities. The current equipment line-up for Highland Pulp includes four harvesters and three forwarders. The harvesters include a Tigercat 845 with a LogMax 7000 head, a Cat TK 711 with a LogMax 7000, a Tigercat 845 with a LogMax 7000 Extreme and a Ponsse Ergo with a Ponsse H73 head. The forwarder team consists of a Tigercat 1065 and1014, and a Ponsse 574 Ecolog. The strong limbing knives and framing of the LogMax Extreme head deliver high performance and reliability in any stand type, including hardwood, for Highland Pulp. 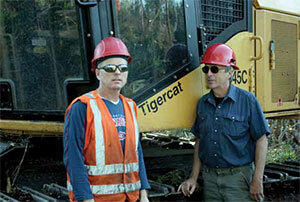 The Tompkins’ admiration for Tigercat technology is quickly obvious when they talk about their gear, and they are convinced that tracks give them the best performance and value from their harvesters, pointing out their oldest harvester has more than thirty thousand hours on its original tracks. Another common product that gets a lot of praise around the Highland Pulp operation are LogMax heads, specifically the 7000 and 7000 Extreme models. “We have been working with LogMax heads for many years and we like the 7000 series a lot,” explained James. “The 7000 will handle any kind of wood we deal with. It might be practical in some operations to have different heads for stands where tree size is relatively uniform, but in our operations we can have just about everything in the stand. It might be uniformly small diameter on the front and a smaller head could handle it, but at the back, when you hit some big stuff, what do you do then? The full crew of operators is 16, and operations run on two shifts: dayshift 6 a.m. to 3 p.m. and the night shift from 3 p.m. to 1 a.m. James pointed out that night shift used to run to 3 a.m., but operators like 1 a.m. better. “We have tried a lot of different shift schedules, and we are happy with what we have currently, not to say that we are not open to try different schedules,” explained James. All the harvesters are scheduled for two full shifts, but one harvester’s night shift will be cut if necessary, to allow forwarders to catch up when there is a lot of wood ahead of them. A significant operations decision for Highland Pulp was to distance themselves from production quota systems. Speaking candidly, James explained: “Quotas by their nature are counterproductive to productivity. We have been penalized for meeting volume quota in the past. Once we met our assigned quota, the reward was to be sent home, park the machines and continue to pay the operators in order to keep them around. Highland has a number of long term employees, but operator retention is a perennial issue with individuals heading west to answer the call of opportunity, generally in Alberta’s oil patch. “Training new operators on harvesters is an expensive proposition,” says James. “When it comes time to bring on a new operator, I look for an opportunity where they can work with fewer challenges than normal operations. 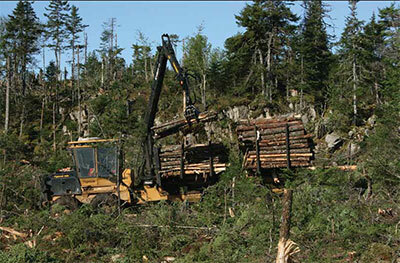 Late in 2011, Highland Pulp took part in “Future Directions in Forest Management” training sponsored by the Nova Scotia Department of Natural Resources (DNR). A number of New Page contractors idled by the mill closure took advantage of the training opportunity, which in addition to giving them some work, also provided some hands-on experience to adapt to new forest management guidelines mandating less clearcut harvesting. GPS had not been a required technology while Highland Pulp worked for New Page. However, with the move to Bowater operations, GPS became a requirement, so Highland acquired handheld Garmins for the harvesters. Despite the large dose of uncertainty in the Nova Scotia forest industry, Highland Pulp maintains an optimistic outlook, and is committed to their business plan and dedicated to their professionalism.